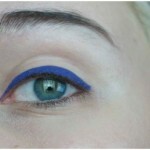 Eyeliner may or may not be a staple for you, but it is one of the most basic steps of doing your eye makeup. It gives you the freedom to work on the shape of your eyes, emphasize them and fill in any sparse looking lashes. It depends on the texture of the eyeliner and your preference as to how you’d like to apply this – clearly defined or smudged – it looks great either ways. Let’s take a quick look at some of the tips and techniques for this step. Ensure your eyelids are clean and then apply a primer on them, so the eye makeup does not smudge and stays on for longer. To make your eyelashes look denser, apply the eyeliner as close to the lashline as possible so it appears to be a part of your natural lash line. This is called tight-lining. Make a dotted line from the outer to the inwards corner and connect the dots (you can use a stiff slant brush to blend the dots out into an effortless soft line). Make sure the tip of your liner is thin but blunt to achieve precision and so you get the perfect shape. 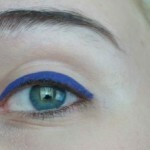 You can also freeze your eyeliner before sharpening to keep it from crumbling. To accomplish the perfect winged eyeliner, use a liquid liner – start on the lash line at the pupil and work your way towards the corners. If your hand is not steady enough for liquid liner then first line your eyes with a pencil liner, then trace over it with your liquid liner. To accomplish a smoky eye, opt for a pencil liner as these tend to be softer and creamier. Also, you can smudge it out using a smudging brush for that effortlessly cool smoky eye. As you age, opt for more subtle colors like brown for a more elegant look and apply mascara to complement the simple look. Note: Always tilt your face up and look down as you apply eyeliner. Doing this ensures you achieve symmetry. Don’t you agree that mascara completely transforms your eyes, giving you that extra oomph? The magical mascara wand makes you look bright-eyed and youthful. It’s a total game changer and the only kind of drama that I like. Here are some important tips for bang-on mascara application. Always start applying your mascara from the roots of your lashes and wiggle your way to the tips. Doing this instantly voluminizes your lashes and does not weigh them down. After applying one coat of mascara, wait for about ten seconds to go in with a second coat (if desired). This way, your lashes don’t get clumpy! Wipe off excess mascara from the wand on a tissue before applying, so it’s easy to maneuver and won’t clump (you will also avoid the horrid spidery-lashes look). Before you go in with mascara, always make sure to curl your lashes using a high-quality eyelash curler. When you go in with curling, pinch your eyelash curler at last base and hold it tightly rotating upwards. The way you hold your mascara matters! Hold your wand horizontally for thicker lashes and vertically (especially for the lower lashes) for a more natural look. If you want to make your mascara last longer, then stop pumping the wand while pulling it out (this way you are only sending in the air to dry the product out), just swirl it to prevent it from drying out. Note: For best results, mascara should be the last step of your eye makeup. Eyeshadow does the job of adding depth and giving dimension to your eyes. If it’s applied correctly, it makes your eyes look bigger and helps accentuate your eye color. Want some tips? Invest in high-quality products and brushes. They will go a long way besides ensuring proper application and blending. 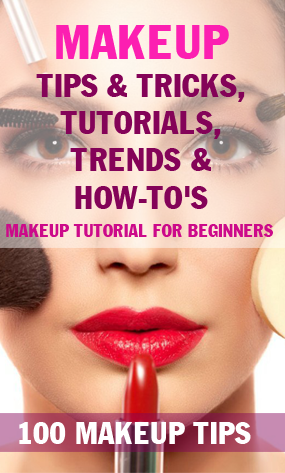 If you want your eyeshadow to stay put all day and not crease besides wanting the eyeshadow color to really pop out – use a good primer before you go in with the eye shadow. On the other hand, if you want to make a less pigmented eyeshadow look vibrant and poppy, cover your eyelid with a white eyeliner first. This helps to cancel out the color of your skin and it creates an even base for your eyeshadow. 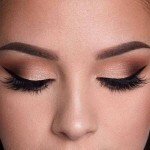 For the bottom area of your eye (that is just near the lash line) – use a dark shade of eyeshadow, for the area above that, use a medium shade and for the top, use a light shade and blend them well. Eyebrows are often underrated, and I can’t begin to stress how important they are to provide a structure to your face. Well groomed brows are indeed a game changer, they frame the eyes and they drastically ‘up’ your beauty quotient. If you are someone who has over-plucked them, then worry not, because just a little bit of added definition will make a big impact! There are various brow products available in the market. Pick a shade that best suits you hair color and fill in any gaps using the product. The most important thing to remember while defining your eyebrows is to keep the look as natural as possible. For this – make sure to blend the product out properly to avoid any harsh lines and such. Use a subtle highlighter right beneath the brow, under your arch to show off the shape and to add height to your brows. If your eyebrows are out of control, use an eyebrow gel to keep them in place. They also tend to look a lot better and groomed with just a little bit of that gel. Do you want to know the best trick in the book? For a bolder look, use an angled stiff brush and wet it before you fill your brows in with matte brown eyeshadow.